Our HomeLift is the perfect, small footprint lift for your home. Our Inva StairRiser is a platform lift suitable for both curved and straight staircases. We offer platform lifts, self supporting lifts and stair platform lifts for internal and external use - and we’d love to help with your next project! We supply the shaft and we have amazingly small footprints available! We are platform lift specialists with many years experience installing wheelchair platform lifts and vertical platform lifts for the UK, and are committed to delivering top class products and services to all of our Customers. Use our Lift Finder to help choose the lift that's right for you. We are lift specialists with many years experience installing wheel chair and vertical platform lifts for the UK, and are committed to delivering top class products and services to all of our Customers. Our most popular products are the MC2000 platform lift, the M6000LS cabin platform lift and the InvaStair-Riser, our elegant, slim-line wheelchair stair lift. All of our products are designed to comply with the relevant UK and EC Directives, and are ideal for installation in all environments, including domestic and public. We regularly install units in schools, retail outlets, churches, libraries, offices, care homes, hospitals etc. Invalifts offer an extensive range of bespoke inclined and vertical platform lifts, passenger lifts, stair platform lifts and wheelchair lifts for both internal and external use. We are on hand to advise and support you when choosing the most suitable type of platform lift for your needs, ensuring all personal and legal requirements are met. From style detailing to cabin design, our cutting edge solutions can be adapted to match the surrounding environment. We supply and install only high quality, space efficient, reliable platform and passenger lifts, complying with the relevant UK and EC Directives. Many buildings & premises hold unique challenges in terms of structural and practical limitations; we specialise in providing expert solutions for every property – even older and listed buildings. Whether you require a platform lift in a public, commercial or domestic environment, we can tailor each project to your demands. 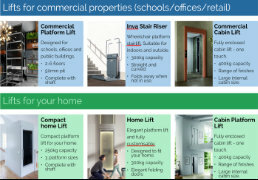 We regularly work with home owners, landlords, architects and developers to create ideal lift solutions and install units in various universities, schools, retail outlets, offices, libraries, care homes and hospitals. We pride ourselves in providing excellent customer support and dedicated service even after installation, with an accomplished team of approved engineers nationwide. We offer high quality repairs, servicing and maintenance on all of our platform lifts, giving you direct access to full technical support. Our reputation as platform lift specialists comes from our many years’ experience of installing wheelchair platform lifts and vertical platform lifts across the UK; we are fully committed to delivering top class products and services to all of our customers. Contact us today to discuss your future project requirements and find out what Invalifts can do for you.